So, we are just a week away from the girls' birthday party! Yes, we are having a combined party this year because I'm not sure when I'll be going into labour in December. As far as I can tell, we'll probably be busy with a newborn when Ariel turns a year older just three days before Christmas. I sure hope they don't mind that we are doing it together this time and as usual, keeping it a small scale party in the comfort of our cosy house. 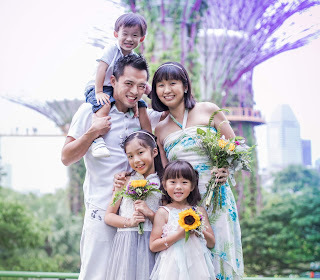 Come to think of it, all my kids will be year end babies and it's going to be a challenge to have to plan three separate parties so maybe we will just do it together from now on. Oh well, we'll see about that. 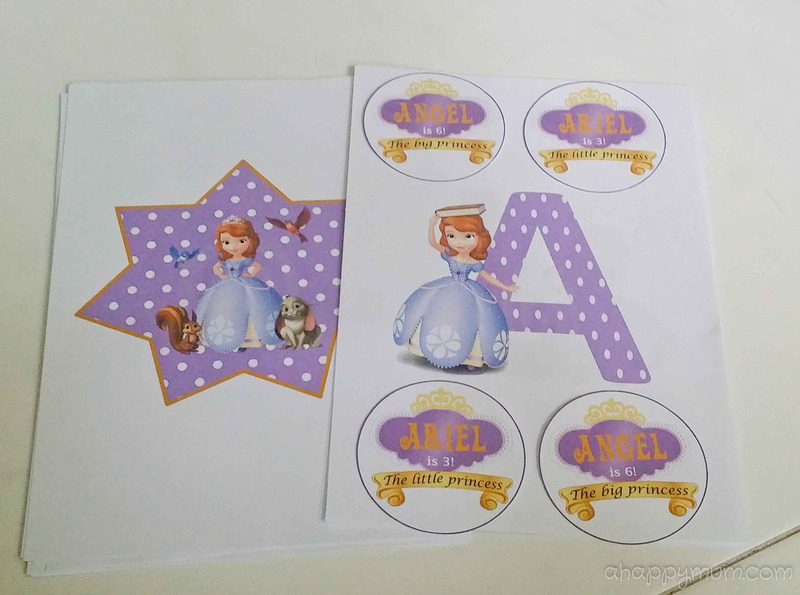 Anyway, in case you don't know yet, we'll be having a Sofia the First themed party this year because this was what Angel had chosen months ago. Since Ariel's favourite colour is purple, I thought this would be the perfect theme for them too. 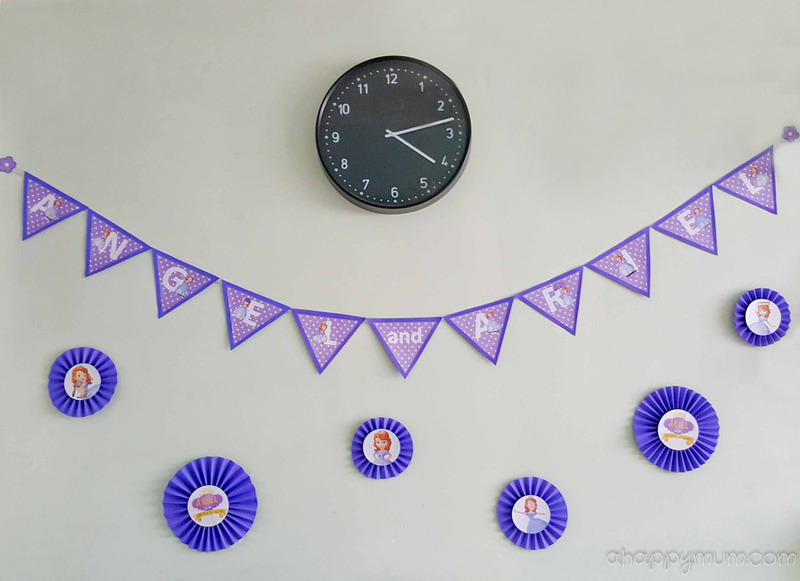 In today's Creativity 521, I'm sharing with you on how we did some simple wall decorations using just a colour printer and paper! Yes, I didn't buy any banners or fanciful decor to stick on the walls and thought these would suffice and save cost too. Moreover, I like my decor to be personalised and the best way to do that is to do it yourself. Firstly, the obvious words I wanted to put up were "Happy Birthday". Instead of Photoshop, I figured out Powerpoint would do a good job too and was much easier to use. So, I inserted a star shape on every slide and gave it a golden border. 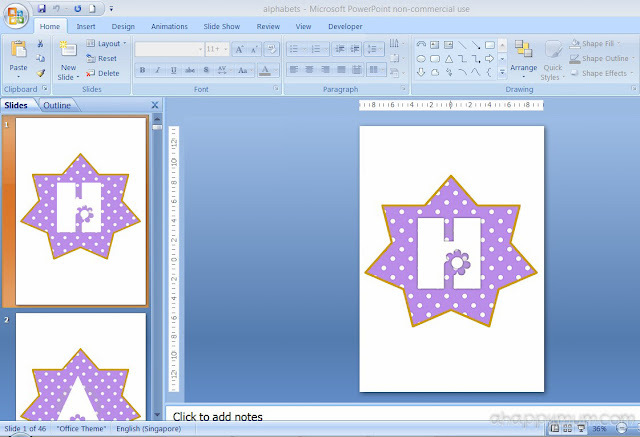 To create the desired background, for instance I wanted the purple and white polka dots to suit the theme, all you have to do is search for the picture online, right click on the shape to 'format picture' and insert your picture in 'fill'. For the text, use a nice, bold font that stands out from the background. 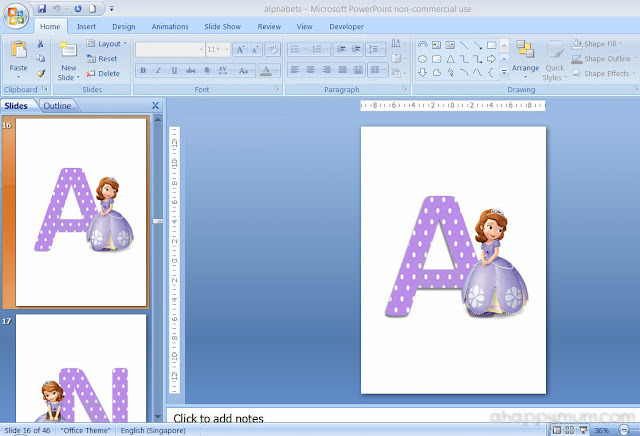 Depending on what you like, it is optional to add shadow, glow or outline using WordArt. For mine, I went with the font Flores and size 170. Next, I wanted to add their names and also to add in pictures of Princess Sofia. For the letters, I used the font Calibri size 550 and used the same purple polka dotted picture by highlighting the letter, right clicking and adding it as 'text fill' in 'format text effects'. 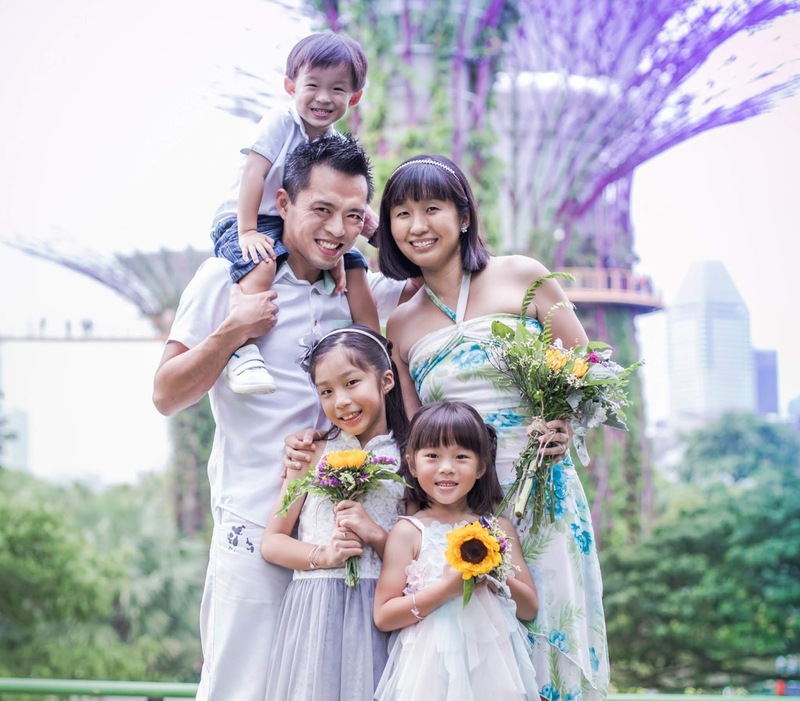 To add in your desired pictures, search for PNG images online (these come without background), save them and then just add and position accordingly on every letter. Just to jazz things up a little, I also wanted to make some purple accordion flowers (see tutorial from previous post) to paste onto the wall and so came up with these circular shapes to stick on the flowers. 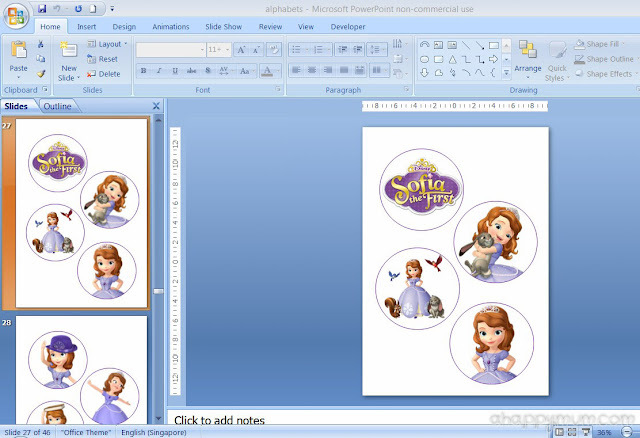 In Powerpoint, insert circles and 'fill' them using Sofia the First pictures. You can try playing around with the offsets (left, right, top, bottom) till you achieve the best fit. I also downloaded an empty Sofia the First logo so that I could personalise them with the girls' names and ages. Once you are done, print out the shapes and letters and cut them out neatly. You might need to use a craft knife for the more intricate areas. 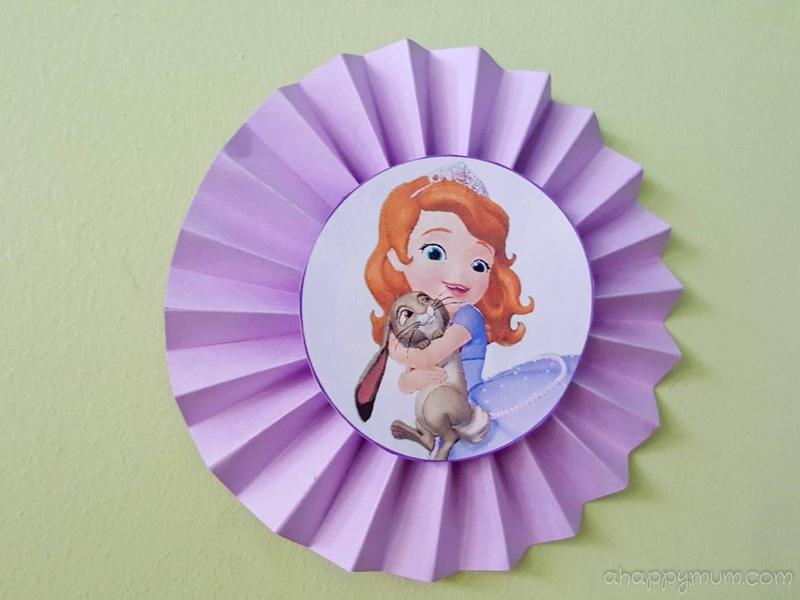 Do up the accordion flowers, which takes the most time and effort, and then stick everything onto the wall using Blu-Tack and ta-dah, you have a personalised themed wall decor! Since I still had an empty space on another wall area in the living room, I wanted to fill it up too and make dark purple accordion flowers for this. 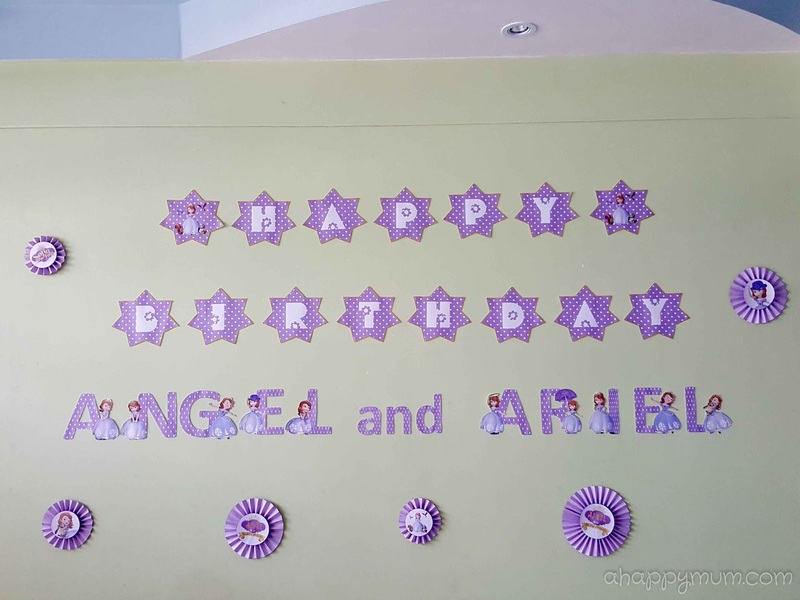 In addition, I also made a bunting that says "Angel and Ariel". 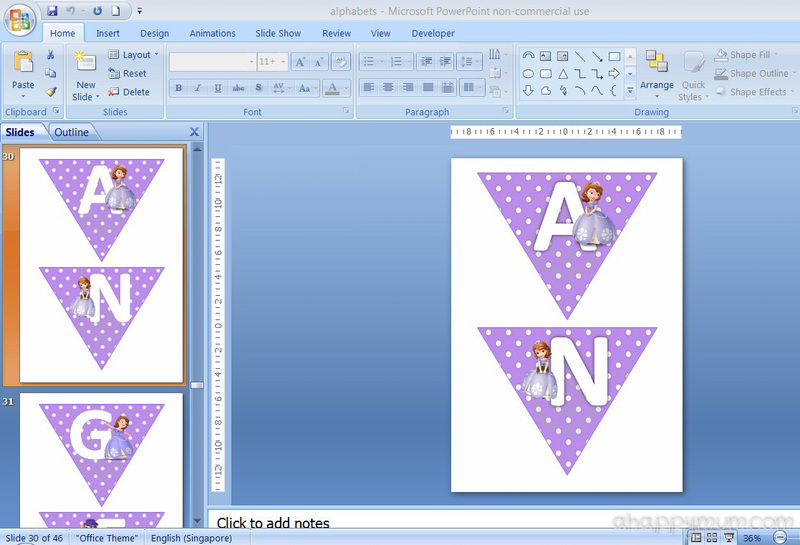 To do this, I created triangular shapes in Powerpoint, filled up the background, added in white, bold letters in the Calibre font and inserted the Sofia the First images individually. 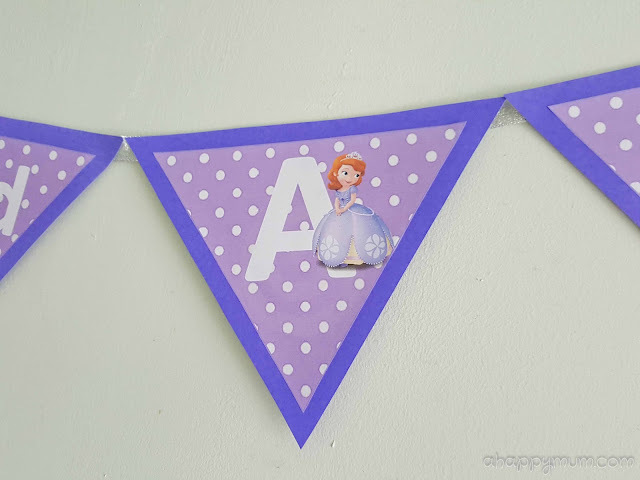 Then, I cut them out, stuck them onto thick, purple paper and cut each one out, leaving a thin border around the triangle. To join them together, I used double sided tape, a ribbon and also used printed purple flowers to conceal the two ends. Hang up the bunting using Blu-Tack at the two ends and tops of the triangles only. There, our DIY wall decor was all done!!! 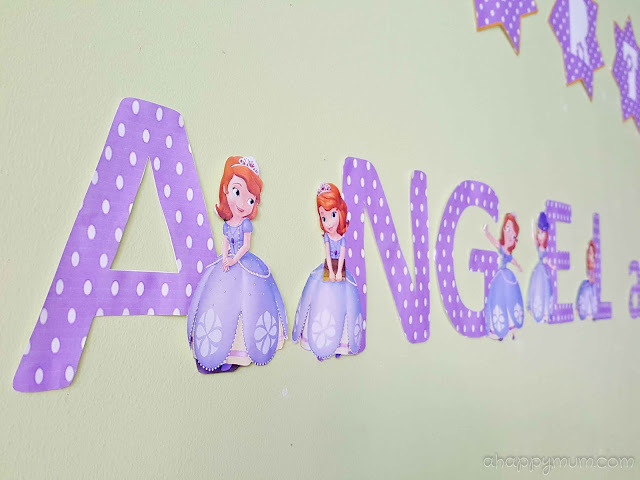 The girls were definitely elated to find so many pictures of Princess Sofia in our house and even more thrilled to see their names and know that their big day is coming. We'll be sharing with you more birthday ideas next month, stay tuned!